Scrappy Boy: Coloring Like Crazy!!! Hello and welcome back fellow crafters!! I’m trying to get caught up on my blog posts. I gotta stop getting so behind!! 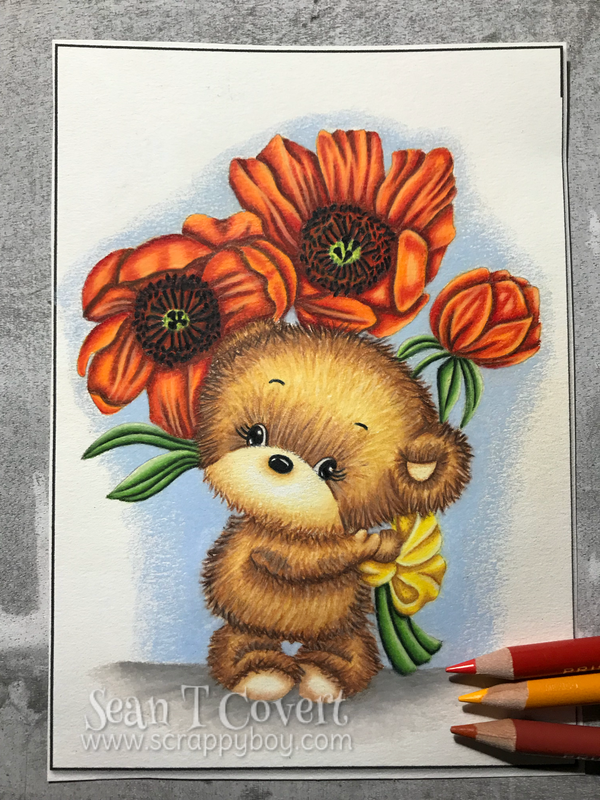 Here’s another coloring class I did at Kit & Clowder with my Prismacolor pencils. (sorry, I leave my message as a comment because I didn't find contact form on your blog, hoping you'll see it soon). I'm writting an article for the issue n°46 of the french magazine called "Passion cartes créatives". I wish show your beautiful card (seen here : http://www.scrappyboy.com/2013/07/trying-some-different-techiniques.html) within this article. If yes, could you please send me as soon as possible a high resolution photo of your creation. Thank you in advance for your quick answer, even if it is negative, so that I can get organized (I have to give my paper for tomorrow). Beautifully colored, the texture looks great and I love the colors of those flowers.